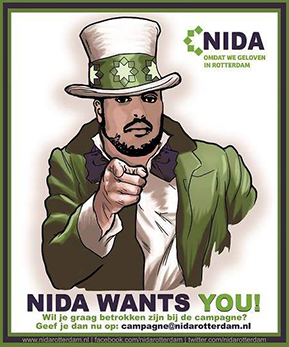 Dutch Muslim Political Parties Campaignwatch: Nida Rotterdam | ACT? Muslim political parties in the municipal elections 2014 campaignwatch. In this section Nida Rotterdam. For general profiles see HERE. Cherish life: focusing on health, environment and safety. Value faith: human capacity for meaning making and spirituality is of vital importance for a harmonious society and should be protected. Share wealth: Diversity of people, quality and sustainability are necessary for changing the current economic short term focus on growth. Fulfilling oneself: Everyone should be able to develop oneself as much as possible in cognitive, emotional, social, creative and spiritual ways. An educational program that focuses on the shared history of the people of Rotterdam: how it got founded, influx of migrants throughout centuries, World War II and rebuilding the city, colonial migrants and guestworkers. Investment in neigbourhood activities and family support. The social-democratic PvdA ais the strongest political party in Rotterdam for years. They are accused of clientelism (in particular ethnic clientelism as a result of a strong participation of Turkish-Dutch politicians) and using migrants as their voting cattle (stemvee). On Valentine’s Day the party send 10.000 postcards with the text ‘Het zit de PvdA niet mee, geen stemvee in onze moskee‘ (‘The PvdA is struggling, no voting cattle in our mosque). 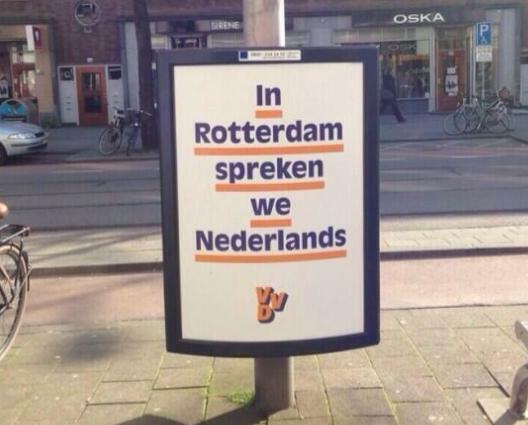 7 March: the conservative liberal party VVD used a campaign poster in Rotterdam saying: In Rotterdam We Talk Dutch: The poster signifies their message that people who want to integrate into society need to learn the Dutch language referring to migrants but excluded the expats. The VVD wanted to provoke a discussion about integration (and to a certain extent succeeded in doing so). 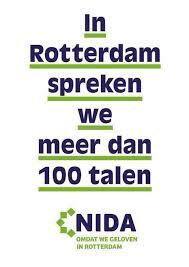 Nida responded with their own new poster saying: In Rotterdam we speak more than 100 languages referring to the diversity of Rotterdam and the status of Rotterdam with its harbour as one of the main ports of Europe. Campaign watcher Willem Dudok praised the response as timely and effective also in the sense that this is a missed opportunity for the social democrats.